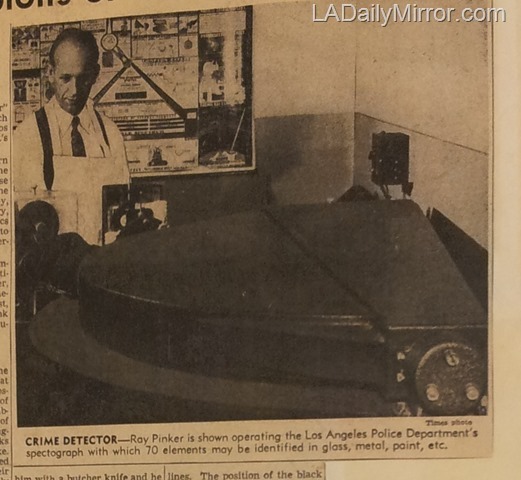 Here’s a feature from the LAPD scrapbooks at the city archives on police chemist Ray Pinker and the LAPD crime lab, which in those days was at the old Central Police Station on 1st Street. Bloodstain pattern analysis in 1946? Yes, the LAPD was doing it. This entry was posted in 1946, Crime and Courts, LAPD and tagged 1946, bloodstain pattern analysis, crime and courts, crime lab, lapd. Bookmark the permalink.